It’s a thought many new and soon-to-be parents have: How can something so tiny require so much stuff? While you might not need all the gear you’ve stocked up on, there’s no getting around the fact that having a baby will bring changes to your budget. You aren’t compromising your child’s future if you don’t buy every new gadget that claims to make the baby smarter, less fussy or a champion sleeper. “Don’t compare yourself or your child to other moms and other peoples situations. Do the best you can,” advised Alexandra Hopkin, a financial counselor with Gen Y Planning. Sure you used to cook all your meals, clean the bathroom every week and do all the ironing. But the first few weeks with a new baby tend to be a sleep-deprived blur. But that convenience comes at a cost, which is why experts suggested adding some extra spending to your budget to make sure you won’t be left in a cash crunch. Tool: How much will it cost to raise your child? Unplanned expenses are even more likely to crop up with a baby. Those bottles you spent hours researching? The baby hates them. Or the stroller you agonized over doesn’t seem to be the right fit. “Definitely make sure your emergency fund is fully funded,” said Roberge, who recommended having at least six months of expenses saved up. Having extra money stored away can also help make the transition back to work easier. The decision to start a family is often preceded by purchasing a house, and many new homeowners don’t take into account the future expenses they incur after having a kid. “They don’t necessarily plan for increased child care expenses when deciding on a manageable monthly mortgage payment,” said Roberge. Sometimes you just have to buy those cute footed pajamas for your baby. We get it. But your baby’s entire wardrobe, toy box and nursery don’t have to be filled with brand new items. Child care is expensive, but let Uncle Sam blunt some of the cost. The Child and Dependent Care tax credit offers eligible parents a tax credit on expenses up to $3,000 per child. While that’s a drop in the bucket to what many parents pay for care, it’s better than nothing. Some parents can also set up a Flexible Spending Account through their employer to set aside pre-tax money from their paychecks to pay for child care. Find out if your employer offers one, and take advantage if you can. Dropping your kid off at college seems far into the future when you’re just trying to make it through the day with a newborn, but parents should start saving right away, according to experts. The earlier you start saving — even if it’s a small amount — the better. “Time is an investor’s best friend,” said Bill Van Sant, CFP, senior vice president and managing director at Univest Wealth Management. Most states offer a tax-advantaged 529 college savings plan that allows parents to put away money to fund their children’s education. You don’t have to choose your home state’s plan, but some states offer a state tax deduction on contributions. 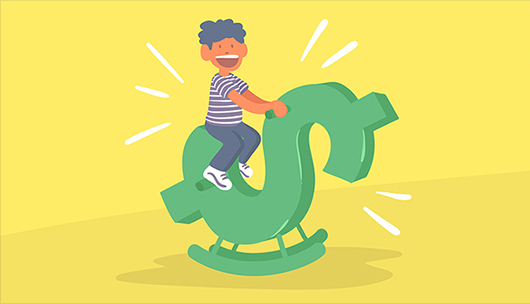 It can be tempting to redirect money being funneled into a retirement plan to help make ends meet post baby, but experts warn against the move.